There is something strangely entertaining about watching Kirito suffer. It hasn’t been happening nearly as often lately, which is possibly one of the main reasons I dropped SAO II, come to think of it. Today, we return to the first season of SAO, where Kirito is the poor, misunderstood gilded hero who has yet to reveal the true extent of his badassery. Hiding his true strength is what causes the poor people around him to suffer and die! He couldn’t protect the fragile girl! SUCH WOE, MUCH MISERY. With the obligatory snark out of the way, I’d say this episode did pretty well for itself and I thought it was a very good standalone piece! Yuuki Itou, the episode director of episode 3, doesn’t have a particularly standout style, but he has done some great work in the past, including the key animation of the Bungaku Shojo movie (which was, if nothing else, a visual delight). I was impressed by how well episode 3 of Sword Art Online managed to convey so much expression and emotion with such a story that was so obviously abridged. I think Itou was able to achieve this by using visual cues that managed to breathe enough personality into what were ultimately one note characters. This shot was my personal favourite from the episode. 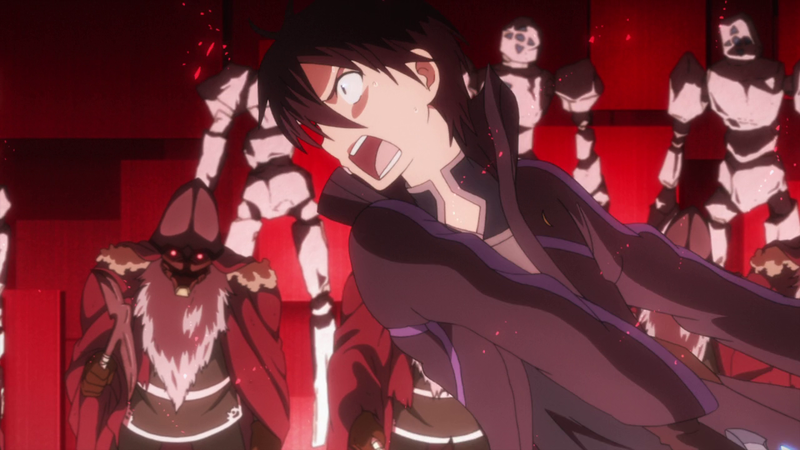 All colour is removed from the background and even the monsters themselves, emphasing how removed Kirito is from his immediate context. The camera zooms out jarringly, clearly showing not only just how many monsters are in the vicinity, but also emphasising the irrevocable distance between Kirito and Sachi. This sequence from earlier in the scene was also extremely effective. 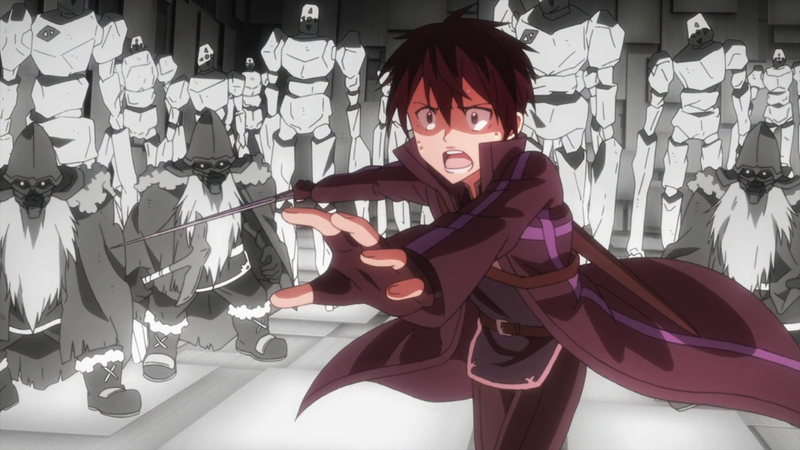 The red filtering emphasises Kirito’s desperation and bloodlust, while the camera pans quickly to follow all of Kirito’s movements, showing a panorama of neverending monsters. Sure, the script might not have done a good job establishing the characters for us, but the visuals display very starkly what Sachi and co. mean to Kirito. 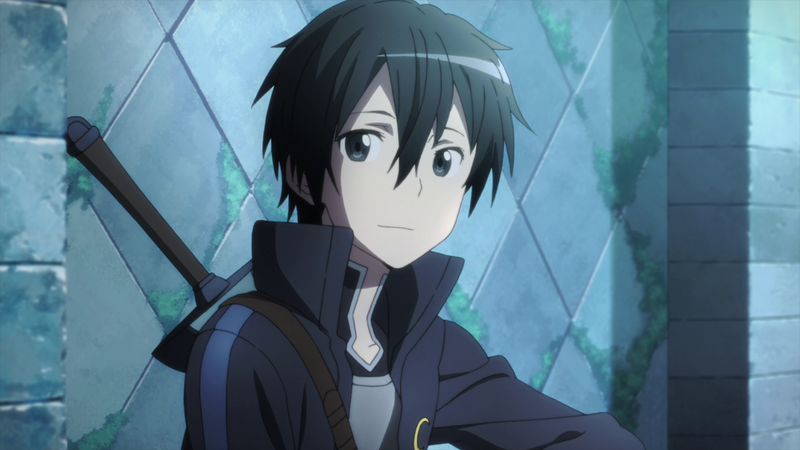 So yes, this episode may revolve around Kirito’s perspective, but here, he’s really not such a bad character. In the larger context, this episode was about the powerlessness people feel in the context of Aincrad. To an extent, you might have agency in this world – you can join a guild and you can play the game at whatever pace you like – but ultimately you’re trapped in a death game you can’t escape. But this is not the same as real life. This world is much more dangerous than the real world. The players have not yet adjusted to this new, heightened sense of reality, but soon enough they will. Man, the early episodes of SAO had some great stuff going on. 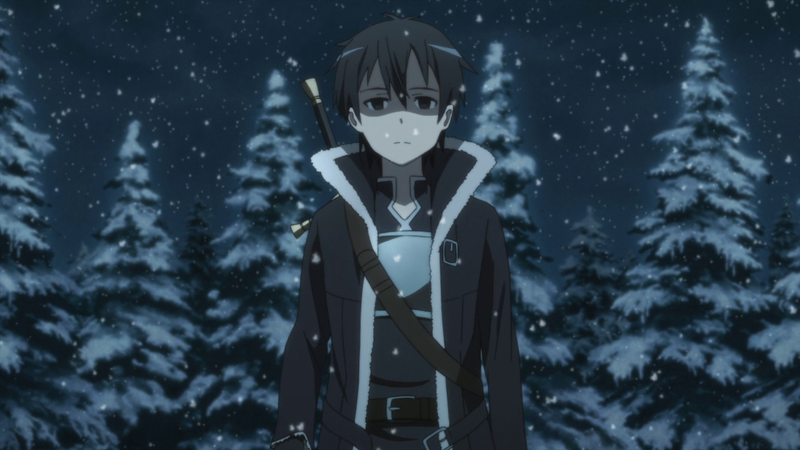 All in all, I came out of this episode feeling pretty convinced that Kirito did not have a Very Merry Christmas. Poor chap. At least he got to meet Santa, though! Posted on December 17, 2014, in Funny Anime Stuff and tagged 12 days of anime, sword art online. Bookmark the permalink. 33 Comments. Watching SAO is relaxing. It’s a very honest show. I agree with that to a degree. The show does wear its heart on its sleeve. 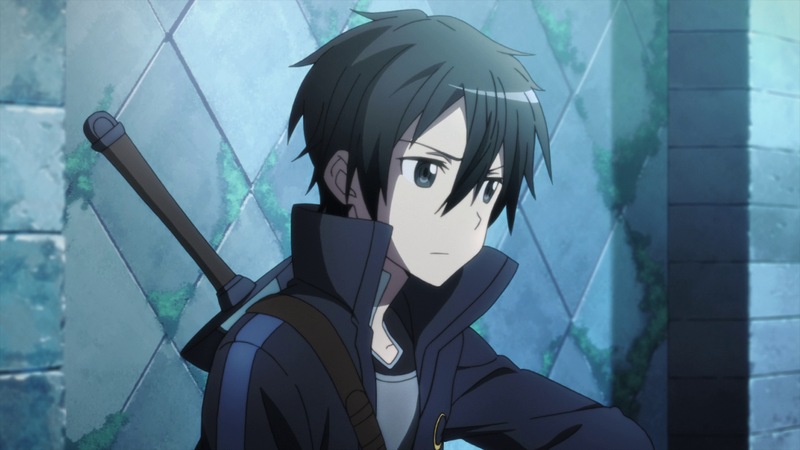 Although some of the episodes in SAO II were so uneventful they were boring to me. Alas. Go rewatch CCS filler, you :). What’s with you and suffering anyway? Are you a sadist? And all he had to do in order to save Sachi was to pat her on the head. But that would cost her agency and causing her to join Kirito’s harem. But i guess it’s better than death………I think. A peaceful death or living as a hopeless harem suitor for a gary stu who’s already has a girlfriend for the rest of your live. Yeah i’ll go with dead. I really enjoyed SAO season one. So much so that it influenced my future in a way (I plan to apply my programming and technology knowledge to help build better VR). Not for the characters, but the possibilities of the world. Anyway, I digress. That episode was, in my opinion, one of the most “spot on” episodes in the series in terms of the portraying and pacing. Certainly the mortality is felt clear, as we latter realize that death in the game is REAL. Truly the directing was good. I don’t think that’s a valid reason to drop it anyway. Sure season 2 first half is tedious as hell and the effort put on trying to make us care for Shinon goes to unbearable lengths. But overall, SAO is a good, fun show. If anything, it has given birth to many enthusiastic fans that will some day create something amazing. your blog seems to be influencing me frog kun! I’m happy that you enjoy SAO and it’s pretty cool to hear that it made an impact on your life in some way. The possibilities of the SAO world were truly endless. As for why I dropped season 2, I don’t think I need to go out of my way to justify it. Even if I enjoyed watching parts of it, it’s still a time commitment. I could be using that time to work or study or translate. I’m a busy person, and unfortunately I don’t have the time to keep up with a long show with tedious parts, even if I agree it had redeeming qualities. Hope you understand! So does that mean you plan to develop a new Oculus Rift that can fry the player’s brain with microwaves and then use it to trap gamers in an MMORPG? Yeppp, it’s always a pleasure to see Kirito get knocked off his high horse. 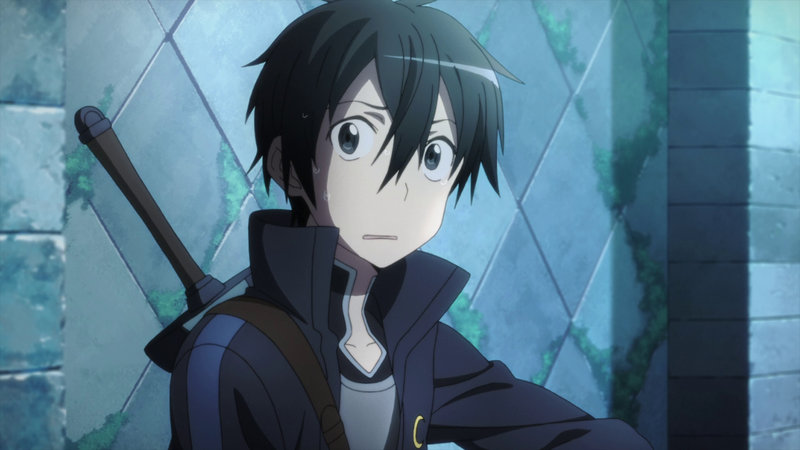 I think Kirito only really became unbearably Gary Stu in the later episodes of the Aincrad arc, and he’s never looked back since. As much as the Kawahara’s world-building doesn’t quite explore its potential, there’s no denying that he’s come up with a couple iconic bits, like Fishing Art Online. 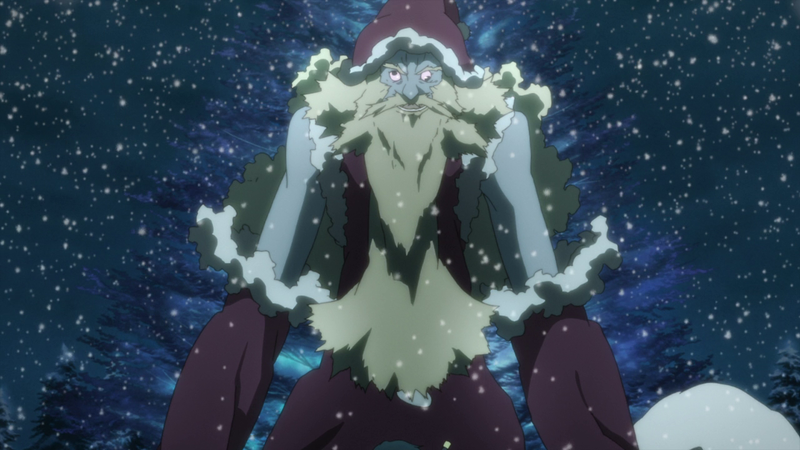 Death to Santa might be my other favorite, and A-1’s visual execution of it was also pretty great. I think A-1 really did a great job with SAO visually. It’s such a sharp, polished work. 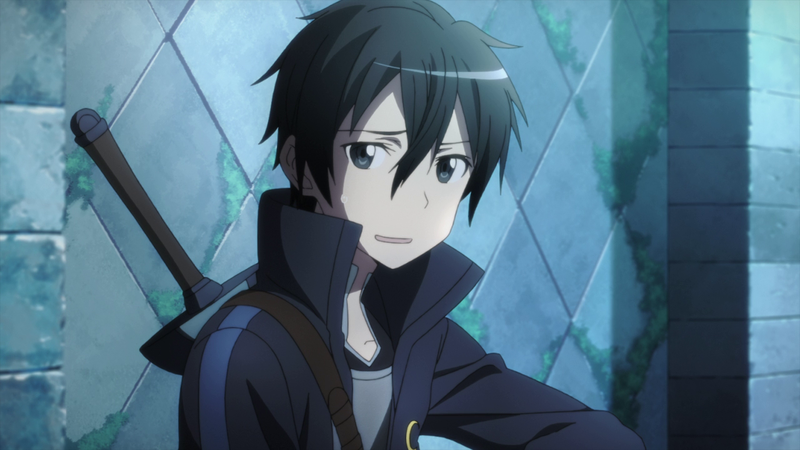 It could possibly account for why SAO is just so watchable despite its overall badness. Ahaha, I’m sorry for commenting a lot, Frog-kun! I have a love for frogs and I really enjoy commenting! Yeah, this episode is great when you view it out of context, but it doesn’t really fit in with the rest of the series. Yeah, it is a great episode and it has me wondering what will happen when Sword Art Online: Progressive reaches this point in the story. Because I honestly can’t help but imagine several volumes of Kirito bonding with the Black Cats followed by several volumes of emo Kirito., and I kinda want that. several volumes of emo Kirito., and I kinda want that. Just because I’m found of Kirito doesn’t mean I don’t feel he should suffer. After all, you know what they say misery builds character. Plus I’ve always felt that if one wants a happy ending then one must go through a lot of suffering before they get it. Yeah, I love that video. Kirito’s a dork like he should be. Still my favourite SAO episode. I like the feels, and boy, did this episode deliver. It was also the fulcrum I used in my write-up on the first season, an episode that only really truly worked when you cared for the characters, but was there to make you care for them. It feels so much stronger on rewatch.